Kyoto is another essential element in exploring Japan. Kyoto was the imperial capital of Japan for over a millennium, until the mid-19th century and is ringed by historic and beautiful temples and gardens, many of which are UNESCO World Heritage sites. Unlike Tokyo, which is served by a comprehensive subway network, the Kyoto subway is basically 2 intersecting lines, which meet near downtown, making downtown a convenient place to stay, with many restaurants, department stores, and shops. For more specifics on transportation around Japan, see my prior post: Japan for the Traveling Photographer & Japan for the Traveling Photographer part 2. Another reason to stay near downtown is convenient access to Kyoto’s kitchen, the Nishiki Market, which stretches for blocks and is a great source for sake, snacks, gifts, ingredients and prepared foods, and is home to multiple restaurants, as is the immediate neighborhood. You can see unusual and delicious snacks being prepared on site. Take advantage of samples to try the wide selection of unfamiliar foods. Nishiki Market, in downtown Kyoto, is a must for the foodie, market-loving photographer: lots to see and photograph, samples to try along the way, restaurants for lunch when your feet need a rest. Another reason I like staying near downtown Kyoto is atmospheric Ponto-chō, a geisha district, which is lit with traditional lanterns at night, a wonderful place for an after-dinner stroll and evening shoot. Many of my favorite Kyoto beauty spots are clustered on the edges of the city, and so are conveniently visited together. One perfect day could be spent exploring temples on the western edge of the city, in the Arashiyama area. My suggested western Kyoto itinerary starts at Tenryu-ji Temple, which opens at 8:30 am. http://www.tenryuji.com/en/ As the website says, it is “a historic site and a place of unusual scenic beauty” and this is no exaggeration. The temple buildings and their integration with the gardens and ponds and the mountains beyond are lovely beyond words. After lunch, head out the North Gate entrance. This leads directly to the famous Arashiyama Bamboo Grove. I have shot here early, before the crowds arrive, and during the day when there will be many people about. If shooting during the day, there are a few strategies to consider to “manage” the people who will inevitably be coming through. I often set up and wait until a person or a couple dressed in a nice complementary color comes through at the right distance away to provide scale but far enough away to leave their identifying features vague. Another option is to do a long exposure on a tripod, allowing people to come and go freely during the capture. They will effectively be blurred out or just suggestions of movement. This will likely require the use of a neutral density filter. The technique is described here. A wide-angle lens will be needed to capture the scale of the towering bamboo. As always, I was shooting with my Fujifilm X-T2, with my widest angle lens, the Fujifilm XF 10-24mm f/4 R OIS Lens. To include people or not in a shot, that’s an artistic decision. A woman walking her dog adds scale to a shot of the Arashiyama bamboo forest in Kyoto, while the version without (below) has a more mysterious quality. At busy times in the Arashiyama bamboo forest, it may be easier to work with people entering and leaving your frame, waiting for someone with nicely colored clothes to pass through your field, rather than wait until the coast is clear, which may be an exercise in frustration. This was shot early in the morning when few people were about. A stroll along this atmospheric bamboo path will lead you to a path heading uphill to another of my favorites, the villa of a film actor, Ōkōchi Sansō. The climb is well worth the effort, as it leads to the traditional style home of Okochi Denjiro (1898-1962), which is surrounded by gorgeous gardens with a commanding view over the city. Two more essential stops on the western Kyoto itinerary are both World Heritage sites: Ryoan-Ji Temple and Kinkaku-ji Temple. Ryoan-Ji is renown for its Zen garden of 15 sculptural rocks in a sea of raked white sand. Less well known is that the gardens in this complex are well worth a stroll. 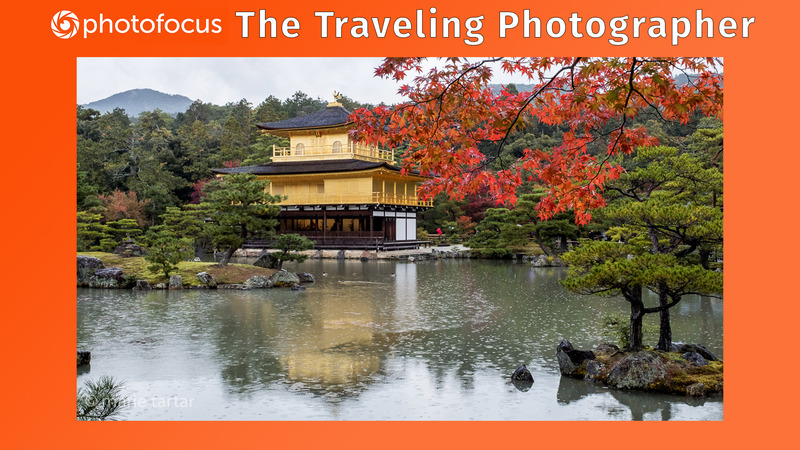 Kinkaku-Ji, or the Golden Pavilion, can only be called iconic. There are always crowds at this site, even in the dead of winter, but this is not an impediment to enjoyment. The temple is situated within a large pond, which effectively isolates this subject. Depending on the season, there may be flame-colored autumn leaves to frame the spectacular vistas. For these shots, I used my Fujifilm X-T2, paired with a versatile weather resistant zoom, the XF 16-55mm f/2.8 R LM WR lens. Every recent time I’ve been there, it has been raining lightly, lending some moodiness to the sky. This itinerary could also be done in reverse, starting at Kinkaku-ji, heading south from there. Either way makes for an unforgettable day!